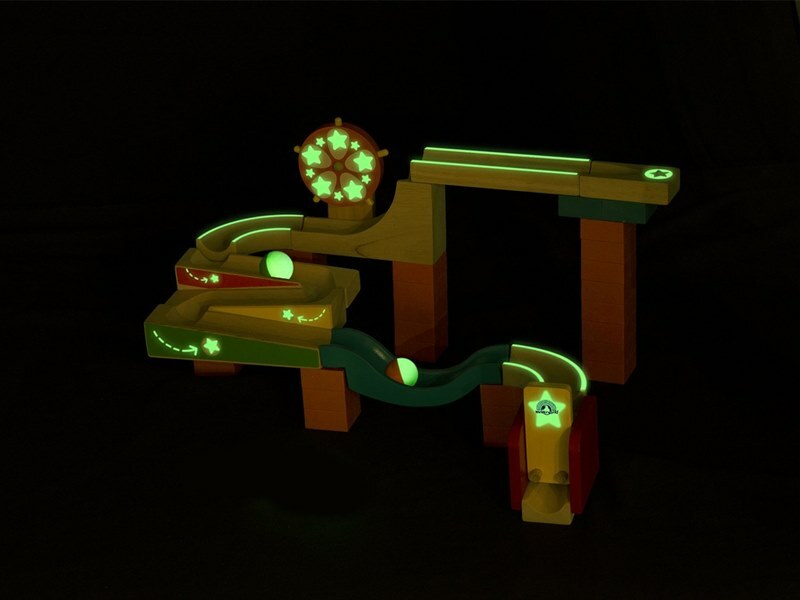 The only thing your kid is going to like better than a basic marble run is a glow in the dark marble run, which makes this toy a sure winner on birthdays or holidays. The awesome glow in the dark Trix Track from Wonderworld has tracks and a wheel that are easy enough for your three year-old to put together, encouraging visual-spatial skills and creative problem solving. Your little one will love watching the ball go through the wheel and down the tracks, then watching it again in the dark to get a whole different view. Made with safe and sustainable rubber wood, reclaimed sawdust and food-grade plastic (in the foundation bricks), plus non-toxic paints for fun and learning that’s safe and eco-friendly. The only thing your kid is going to like better than a basic marble run is a glow in the dark marble run, which makes this toy a sure winner on birthdays or holidays. The awesome glow in the dark Trix Track from Wonderworld has tracks and a wheel that are easy enough for your three year-old to put together, encouraging visual-spatial skills and creative problem solving. Your little one will love watching the ball go through the wheel and down the tracks, then watching it again in the dark to get a whole different view. Made with safe and sustainable rubber wood, reclaimed sawdust and food-grade plastic (in the foundation bricks), plus non-toxic paints for fun and learning that's safe and eco-friendly.